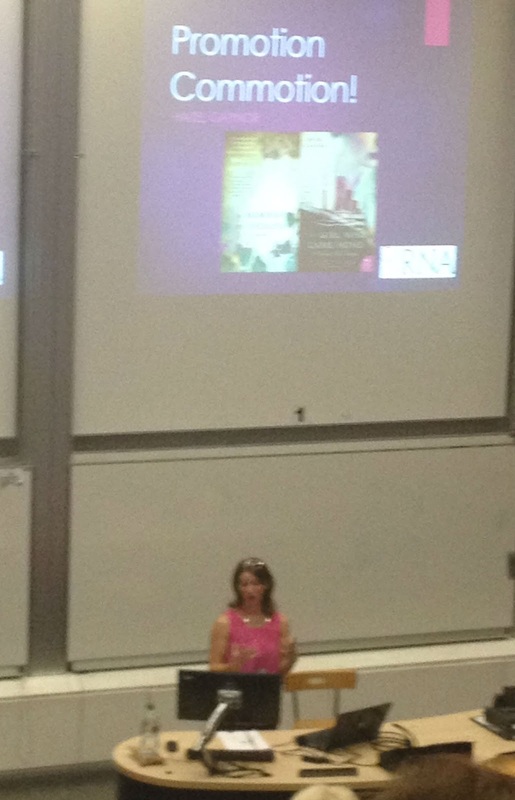 I recently returned from the Romantic Novelists' Association's ("RNA") Conference at Queen Mary University of London. If you missed Part I of this marketing post, which covers Hazel Gaynor's talk on promotion, you can find it here: 'Latest on Book Marketing from #RNAConf15, Part I'. And my neetswriter blog post covers the talks on writing by Julie Cohen, Emma Darwin and Charlotte Betts: 'Going to a Writers' Conference as Two People'. This post will cover the talks by Alison Baverstock and Kate Harrison. I've wanted to hear Alison Baverstock speak for years, as I live near Kingston University in Surrey, where she's a co-founder of the M.A. in publishing, and a senior lecturer in publishing studies. A few writing friends have enrolled on the creative writing M.A and M.F.A degree courses at Kingston University over the years, which has an excellent reputation for the teaching, and for opportunities to meet industry professionals. 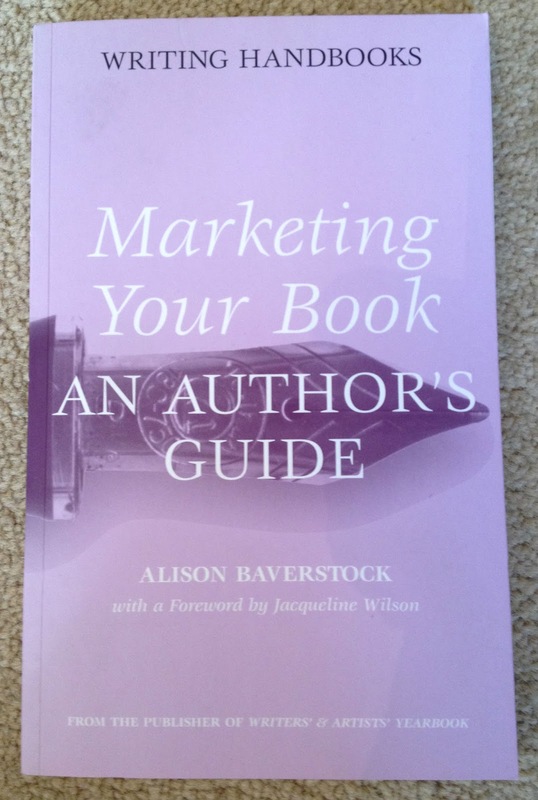 Back in 2006, I bought Alison's 'Marketing Your Book: An Author's Guide', when the world of publishing was very different from what it is now. At the conference, I bought, 'How to Market Books', and Alison signed it for me. "Selling goods which don't come back, to people who do"
Alison talked about the importance of relationships and special sales. "These are titles sold outside normal trade channels, often at particularly high discounts of more than 60 per cent......Opportunity: We have got used to seeing books in supermarkets, but where else might your customer be willing to spend?.....' A more detailed explanation can be found in Alison's book. Alison highlighted that authors have to compete with other products. Book buyers are ageing, books are cheap, budgets for promotion are low. Case studies from five years ago show that the standard price of books hasn't changed, and that there is more discount now. The first edition of Alison's 'Marketing Books' was launched in 1990. She said that in 2015 she partly paid for the launch, she was more involved with the cover; and that now there is social media. This was discussed a little, and my blog post 'My Beginner's Guide to Twitter for Writers' might be helpful. Alison suggested using hashtags such as #Olympics on Twitter; and said she uses #desertislanddiscs and #thearchers. This is a way to engage with an audience beyond your followers. And, how clever is this! 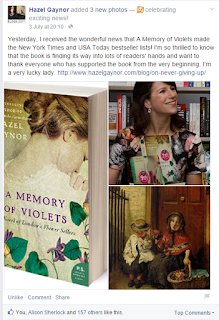 In Part I of this post, I mentioned that Hazel Gaynor used the #ChelseaFlowerShow to promote her book 'A Memory of Violets' (there's an example of the tweet with the post). 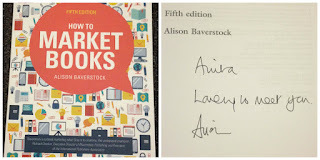 If you'd like to find out more, here's the Amazon link to: 'How to Market Books', by Alison Baverstock. Kate Harrison is an author who has also published a series of 5:2 diet books. I heard Kate speak in 2010 at the RNA Conference in Greenwich on 'managing your writing career', and I remember her saying 'Keep receipts!' (even if you're not published yet). Since then, I've kept receipts for printer ink, paper, writing courses and events in a folder, as you never know when you'll be able to use them for expenses. Reader Insight, the BIG new thing in publishing. What makes readers love or hate a genre or author? When do readers read? Does their behaviour change depending on time/place/mood? Are technology and other behavioural changes affecting how and what people read? How can we get them to read and buy our books? Use the data to help with marketing, social media etc. Writers are closer to readers than publishers and in a better position to understand them through interactions. Tap into social trends: women's fiction, movies, dramas. For example in 2002, Friends Reunited and School Reunions were popular. Currently, tea and cake is popular. The death of a trend can be exaggerated, and trends can last longer than expected. Chick Lit and cupcakes are two examples. "Collect" social trends by using Google Alerts. Stay alert for media coverage relevant to your area. Use what you see and experience, does it have a role in your work? And you'll receive a FREE 40-page fiction summer special e-book, plus future creative writing and marketing information. 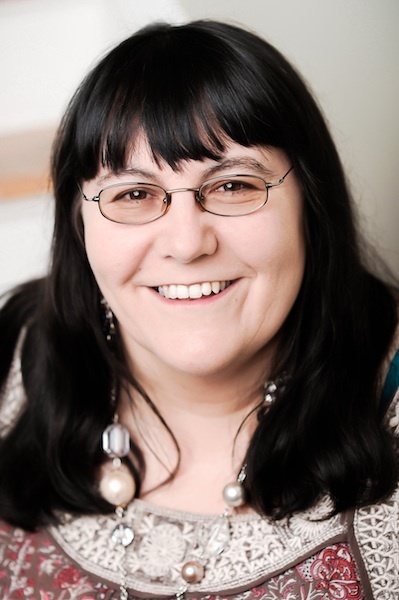 Kate's website has useful information for writers, including advice on writing and agents. That's my final post on #RNAConf15, phew! What a fabulous conference, and such informative talks, both from a writing and marketing perspective. Thank you to Jenny Barden, Jan Jones and Elaine Everest for the fantastic programme and organisation. And now I'm off for a cup of coffee with my new RNA mug. This is what I said on Twitter, what do you think? 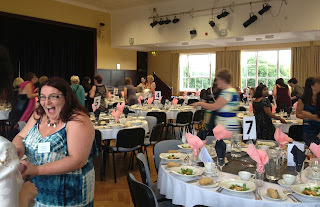 Do check the hashtag #RNAConf15 on Twitter and Facebook for all the lovely blog posts and photos from the conference. 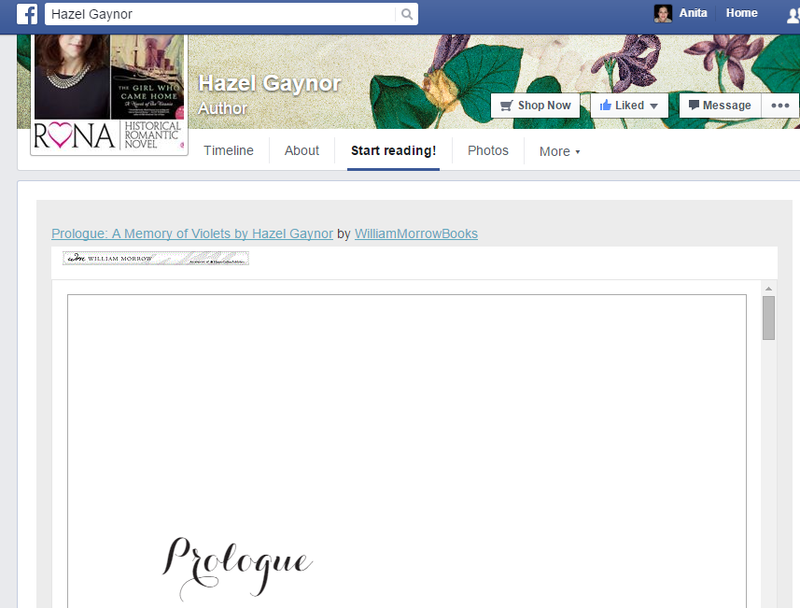 I'm a Freelance Social Media Manager, and my clients are in the world of books. Plus I'm Social Media Manager for the Historical Novel Society and Publicity Officer for the next conference, #HNSOxford16. I'm running another social media course for writers on 3 October in Guildford. The course will be interactive with a big screen; there will be lots of tips on Twitter, Facebook, and blogging, and a sit-down lunch is included. Email me at anitajchapman at gmail dot com for further info. I’ve just returned from the Romantic Novelists’ Association’s Conference at Queen Mary University of London. My neetswriter blog post ‘Going to a Writers' Conference as Two People’, covers the talks on writing by Julie Cohen, Emma Darwin and Charlotte Betts. 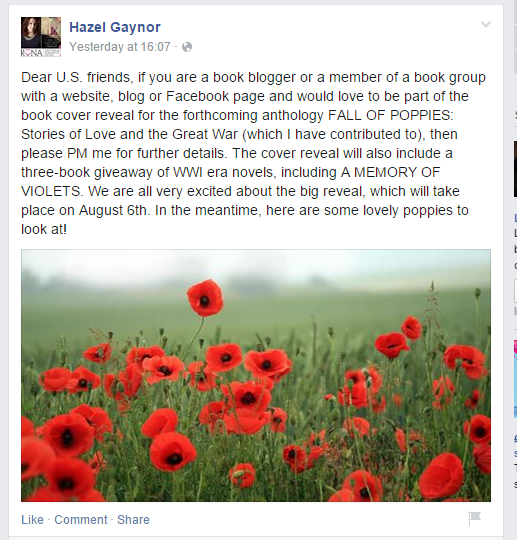 This post will cover Hazel Gaynor's talk on 'Promotion Commotion'. I'll cover the talks by Kate Harrison and Alison Baverstock in my next post 'Latest on Book Marketing from #RNAConf15, Part II'. Hazel Gaynor’s debut ‘The Girl Who Came Home’, a poignant story of a group of Irish emigrants aboard RMS Titanic was a New York Times bestseller and RNA Historical Romantic Novel of the Year. 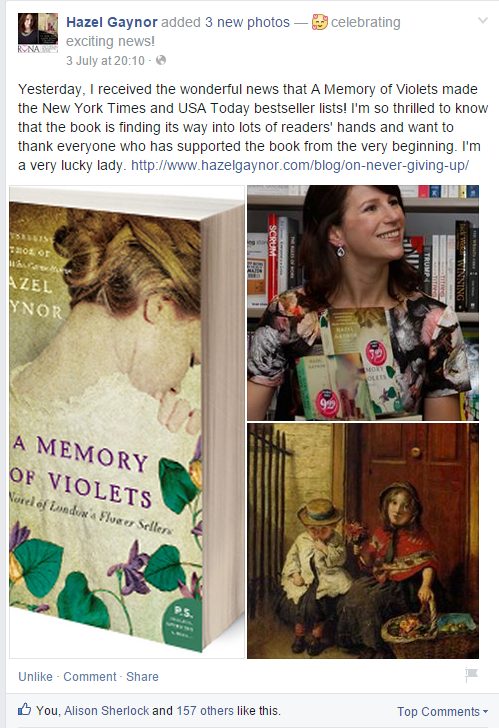 Her second novel, ‘A Memory of Violets’ was a WHSmith Travel Fresh Talent pick, and her third novel will be released by HarperCollins in 2016. I shall definitely be adding 'The Girl Who Came Home' to my summer reading list. Hazel used great examples to explain the points she was making during her talk (I've included some of her tweets and Facebook updates in this post), and this information is so helpful to authors, whether you are traditionally published or self-published. These points are also helpful if you intend to be published one day. By using quotes from the recent Bookseller Marketing and Publicity Conference #mpconf15 (click for link to tweets under this hashtag), Hazel was able to demonstrate how to go about doing this. "The author has always been vital for publicity. They know their book best." In all three talks on marketing that I attended at #RNAConf15, the speakers emphasised the importance of social media for authors. Hazel used another quote from #mpconf15 when talking about social media, and went on to explain what you should do. “Authors must take up the challenge to excel at social media, building communities around their work….," Harkable co-founder, Will Francis said. People are online to be entertained, informed, to connect. Ask yourself why you are there. Social media isn’t a billboard. Be engaging, rather than '#buymybook', and continue to engage in those long gaps between books. Focus on fluid media: Twitter, Facebook, Instagram-what is current and ‘now’. Be there as a user as well as an author promoting their book. Use video: YouTube, BookTube, video on Facebook. Video views on Facebook recently passed those on YouTube for the first time. Use Virtual Events and Festivals such as the Festival of Romance, Podcasting, Google Hangouts. Use Periscope. See #WhereIWrite for an example of how to use it (here's an article on this, via The Independent). Share interesting, relevant book-related content: For ‘The Girl Who Came Home’, Hazel shared images of the Titanic, references about the ship, imagery from museum trips, artefacts sold at auction, and she engaged with people fascinated by the Titanic. Do a Twitter chat, but be prepared. Stick to one hour, rather than a whole day. Run a giveaway or competition, share links of publisher discount promotion, share milestones, such as x no of 5 star reviews or x no of followers. Who are you online? See my posts on Facebook, and another will follow soon on 'Managing What Your Friends See on Facebook'. 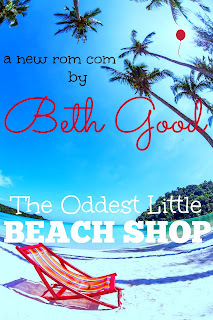 Start showing your progress, the cover reveal, have a Goodreads giveaway, ask for book reviews. Do a blog tour-interviews, chapters, extracts; do Twitter giveaways, have reader discussions, share reviews, share your Pinterest board, use Goodreads and keep your author profile up-to-date, keep your website up-to-date. Visit local bookshops and give them a copy of your novel for the staffroom, and offer to do readings and signings. Approach the organiser for local writing festivals and events. Find local book clubs, ask your librarian about writing groups and book clubs. Offer to run writing workshops at libraries. Try to meet booksellers at conferences, and go to book launches. Connect to book clubs in for example the U.S., if you have a friend there who can help, via Skype. Write articles-online and in print, be interviewed, and write blog posts for eg. 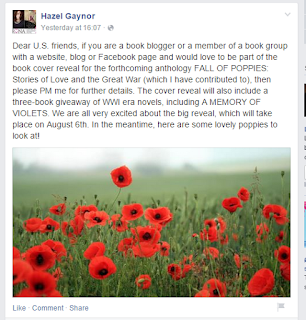 see Hazel's post on the RNA blog. Be creative-eg see Matt Haig's video on how to be a writer. I love this! Pitch to Radio and TV. Know when to say ‘no’, and don't pitch for something that you wouldn't feel comfortable doing. Realise that when ‘it goes bad’, you’re not alone, that it happens to everyone. For example, low attendance at book signings. That's it! Thank you so much to Hazel for such useful advice. I look forward to using some of these ideas with clients, and hopefully one of these days for myself :-). 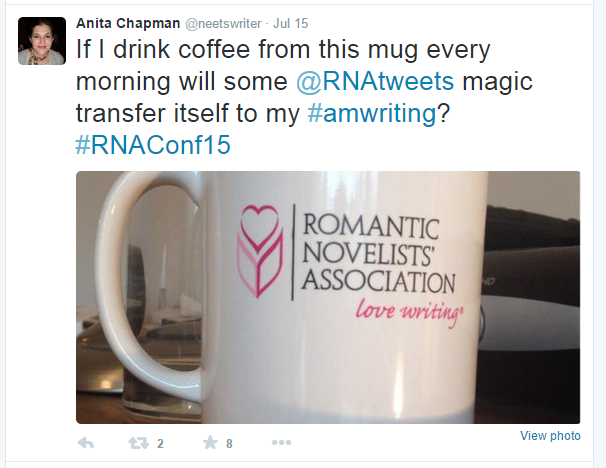 Take a look at #RNAConf15 on Twitter and Facebook to see photos and updates from the RNA Conference. 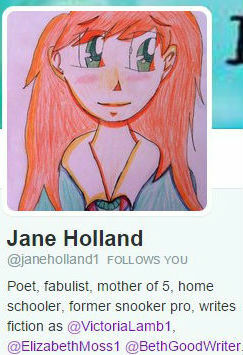 Jane Holland has kindly accepted my invitation to be a guest today. I've met Jane at Romantic Novelists' Association ("RNA") events, and last year discovered her fantastic blog '52 Ways to Write a Novel', which Jane has now transformed into a must-read for all writers looking to be published, '21 Ways to Write a Commercial Novel'. I'm a huge fan of how-to-write books, and Jane's advice is up-to-date, valuable and witty. I wrote an Amazon review here. Jane included many comments from the original blog posts in this book, and three of mine are included. Award-winning author Jane Holland is known by many names, most notably Victoria Lamb, Elizabeth Moss and Beth Good. The middle daughter of 80's Mills and Boon star, Charlotte Lamb, Jane also writes and publishes women's fiction herself, both contemporary and historical, besides running an editorial service for writers (hheditorial.com). 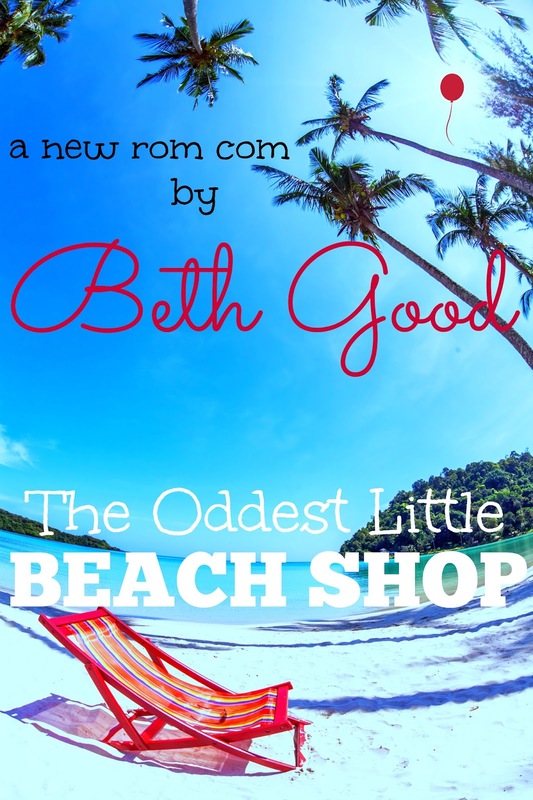 WITCHSTRUCK won the RNA Young Adult Romantic Novel Award 2013, and her rom com novellas as Beth Good have won multiple All Stars Kindle awards for top UK sales. Her combined traditionally published and self-published titles number more than ninety, and her popular Creative Writing blog, 52 Ways To Write A Novel, was recently turned into a Kindle chart bestseller. She is now developing her own digital publishing house, Thimblerig Books, across a range of titles. Jane somehow manages Twitter accounts for Jane Holland, Victoria Lamb, Elizabeth Moss and Beth Good; amongst many others, including those for hheditorial and Thimblerig Books! As an author who writes under numerous pseudonyms, including Victoria Lamb, Elizabeth Moss and Beth Good, I have a Twitter account for most of my names. Publishers expect it, and so do readers now. But maintaining multiple accounts can be time-consuming. And how to generate high follower numbers with numerous accounts? Firstly, decide which account will be your main priority and focus on building followers there. This could be your most popular account so far, or your most successful writing name. Later you can migrate followers to your other names by asking directly or putting links to your other accounts in your profile. To attempt to tweet from all accounts equally could lead to exhaustion, and make your tweets seem flat and repetitive. Secondly, tailor each Twitter profile carefully to its genre, to attract the right followers. If there are other names you admit to writing under, link to them in your profile. This encourages cross-following. Or link groups of accounts if you write under several names for romance, for instance, and others for Young Adult fiction. Then retweet between those linked accounts. Try to develop a special flavour for each account or group, akin to brand identification, that will help your name(s) stick in readers’ minds. Re apps, I have used Tweetdeck in the past, which allows you to be logged into all your accounts at once, and post to them simultaneously. It’s fantastic for scheduling early hours tweets for global markets, or repeats, or for hashtag trends. But followers may get annoyed by tweets that appear on several accounts simultaneously, so I don’t advise using that too often. I also find that once I have all my accounts on screen, Tweetdeck becomes unwieldy. So it’s best for those with fewer than four accounts. Personally, I use my usual browser, and log in and out of accounts as I need, or my iPad, where I can be logged in simultaneously to all my accounts, just like Tweetdeck, but see only one account at a time on screen. (One flick, and you can shift accounts.) This is far easier to deal with visually when you have, say, eight accounts in hand, and less likely to lead you into errors. Managing multiple accounts requires multi-tasking, which means speed and agility of mind as well as fingers. Forgetting who I am, or which book I’m promoting, is not unknown! So the iPad is one I would recommend for larger numbers of accounts, though there are probably interesting alternatives out there. When time is short, use your default, follower-rich account – mine is @janeholland1 – to retweet promo from your other accounts, if you admit to them. This means you are not neglecting your other names, but can promote them without trebling your time online. As long as you don’t over-promote on subsidiary accounts, and remember to chat with followers occasionally, you can maintain a friendly presence on all accounts without abandoning your latest manuscript. Twitter isn’t only for pseudonyms, of course. I have accounts for individual books, for series, and even characters. This was a very successful ploy used by Sylvia Day for her Crossfire series, which I emulated for my own books (with rather less success, ahem). You tweet as the character or post quotations from the book, either single lines or extracts in a rolling series of tweets, and it really brings the book alive for fans. Be inventive with multiple accounts, and see where it takes you. Whatever kind of account you have, it’s important to make each ‘voice’ sound different from the others. To be that person. Don’t just sound like the same person under another name, or someone whose only aim is to sell books. Twitter is about connecting, and we connect more easily to people who are genuinely interested in us and the world. Not just in selling novels! 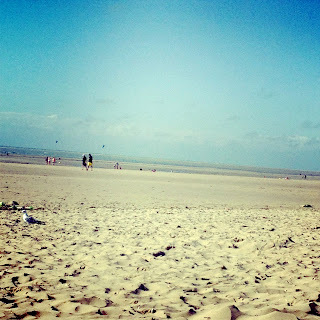 Thank you, Jane for writing such an interesting and informative post for my blog! 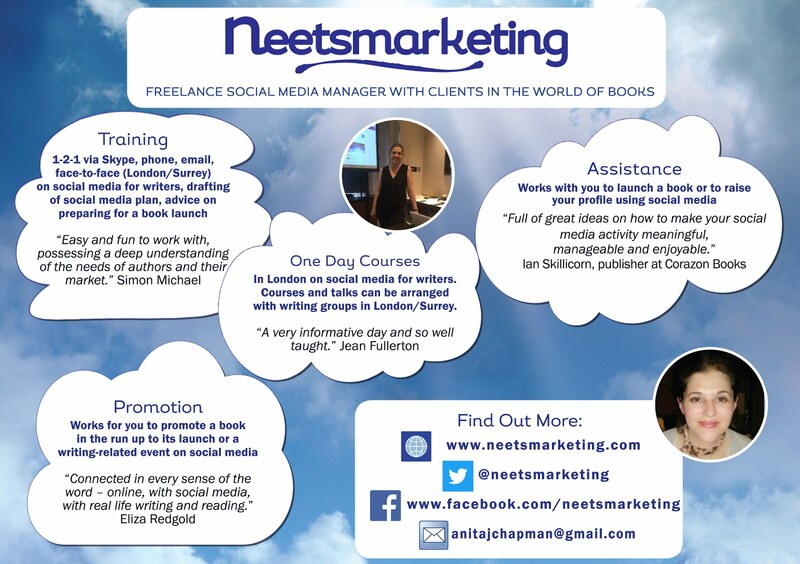 I use Tweetdeck to schedule tweets for clients, and for the @neetsmarketing Twitter account. Tweetdeck is handy for adding search and hashtag columns, but I agree that for more than four accounts, the number of columns can become overwhelming! I try to keep columns for each account together and slide them along the screen, so I can only see one account at a time. Sometimes I may see a tweet which is better retweeted from a different account, and Tweetdeck is useful in this case because it gives you the option to choose which account to retweet from. The iPad is great for switching between accounts, as you say, and if I've been sitting at the computer for hours, it's nice to be able to switch to a comfortable chair with my iPad, and still be able to monitor tweets for each account individually. 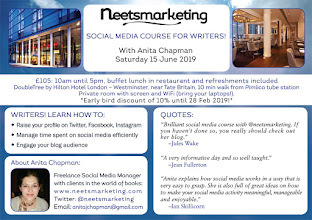 Read more neetsmarketing guest posts from Sue Moorcroft, New Romantics Press, The Romaniacs, Talli Roland and Alison Morton here.